Description: With the delicate touch of an artist's brush, a bold dramatic look and graceful curves are achieved with handkerchief styled? 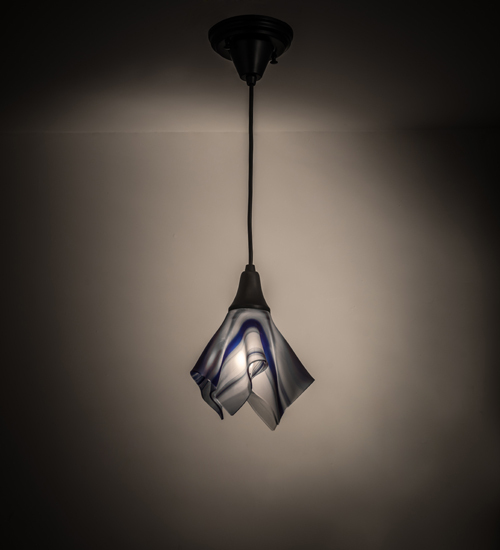 swirl glass, the result of high fired art glass formed into a unique profile that creates conversations with a fashion forward design statement. Curacao colored glass is complemented with hardware finished in Craftsman Brown in our manufacturing facilities in the USA. Custom sizes, styles and colors are offered, as well as dimmable energy efficient lamping. UL and cUL listed for damp and dry locations. Description: With the delicate touch of an artist's brush, a bolddramatic look and graceful curves are achieved withhandkerchief styled? swirl glass, the result of highfired art glass formed into a unique profile thatcreates conversations with a fashion forward designstatement. Curacao colored glass is complemented withhardware finished in Craftsman Brown in ourmanufacturing facilities in the USA. Custom sizes,styles and colors are offered, as well as dimmableenergy efficient lamping. UL and cUL listed for dampand dry locations.